This is a list of sights I think are worth seeing if you have never been to Bangkok before. Now, some of these things may duplicate what you see in travel guides and others may be more off-the-beaten-path. But they are the things I recommend when a guest visits. If you are looking for hotel suggestions, check out this page. If you are looking for my latest list of restaurant suggestions, check out this page. If you are looking for shopping suggestions, check out this page. Every visitor to Bangkok should see the magnificent buildings within the Grand Palace compound to get a feeling of the ostentatious architectural style. The Grand Palace is open from 9:00 am until 3:00 pm every day of the year. Beware tourist scams telling you the palace is closed. If you are dressed immodestly, borrow appropriate wraps at the building just inside and to the right of the front gate in exchange for a refundable deposit. There is also a very good self guided audio tour – rentals are just to the left of the main ticket windows. 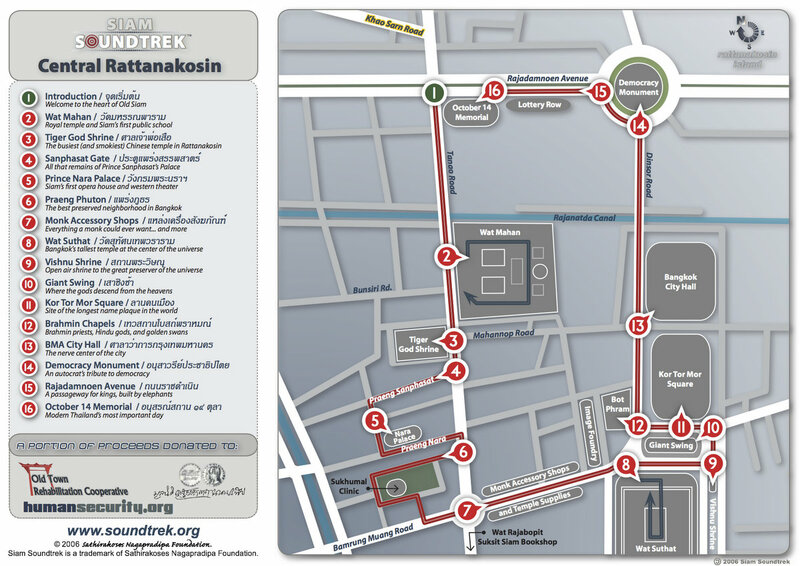 Directions: Taxi from MRTA Hua Lamphung or take BTS Skytrain to Taksin, connecting to Chao Phraya River Express boat to Tha Chang (Chang Pier). This large and extensive temple neighbors the Grand Palace and houses the very impressive gigantic gold-plated reclining Buddha, which is some 46 meters long and 15 meters high. Its soles are inlaid with mother of pearl. Most people just see the large statue and then move on but the back half of the temple is peaceful and well worth exploring. Also prone to scams about being closed by the temple is open at least until 6:00 pm and recently has been open into the evening. Directions: Same as for the Grand Palace, except if you take the boat, alight at Tha Tian (Tian Pier). The Khmer-style towers of Wat Arun immediately across the Chao Phraya River from Wat Pho, are one of Bangkok’s world-famous landmarks. The temple was built during the Ayutthaya period. Climb the sides of the tallest stupa for a fantastic view of the river and, across it, the Grand Palace and Wat Pho. Directions: Best to take the BTS Skytrain to Taksin station, connect downstairs to the Chao Phraya Express Boat, alight at Tha Tian (Tian Pier) and then take the 3-baht ferry across the river. One of the oldest parts of town, the Bang Lamphu district has become famous over the years due to the emergence of Khao San Road as a popular destination for the world’s scruffy backpackers. Er, young budget travelers. The area gets its name from the lamphu trees, which have vertical roots and attracts fireflies. Bang Lamphu has been the location of many of the major events in Thailand’s history. The Democracy Monument on Ratchadamnoen Klang Road has been the rallying point for many political movements. There is an interesting walking audio tour of this area, created by the sadly now-defunct Siam Soundtrek. A link to their map is above, which provides a detailed route to follow. I happen to have their MP3 files – you can download them from this Dropbox folder. Below are two of the key stops on the tour, which you can see with or without the map! The Golden Mount is on a man-made hill (and the only hill in Bangkok) with a diameter of 500 meters and soars 100 meters to the sky. There was a small chedi on this site and after it collapsed, King Rama III commissioned the constructed of a much larger one which was completed during the reign of King Rama V. There is a decent view and usually a nice breeze. Directions: Take the MRTA to Hua Lamphong station and taxi or for a more interesting journey, take the Khlong Saen Saep canal boat to the end of the line, Panfa Leelard pier. Located on Mahachai Road next to Wat Ratchanatdaram is the unique Loha Prasat (Metal Castle) Pagoda. The pagoda is in the shape of a square with 3 stories and 36 small pagodas along the edges of the floors and one at the center of the top floor. Presently, it is the only one of its kind left in the world. Next to the temple is a beautiful pavilion newly built for receiving guests of state, and the nearby Statue of King Rama III. Directions: same as for Golden Mount. London has its Covent Garden, Paris has Les Halles, Bangkok has Pak Khlong Talat, which is the biggest fresh flower market in the city. The Thai people have a great appreciation for fresh flowers, both for the beauty and the fragrance. This is where people come to buy their flowers at wholesale prices. The main activities at the market take place late at night and in the early morning. This is a good place to go if jet lag is keeping you up late or rousing you at an early hour. Covering an area of 58 hectares, Lumpini Park has so much to offer visitors right in the center of the city. The lush, green lawns are ideal for family picnics, while the two lakes have paddle and rowing boats for rent. Throughout the park there are vendors selling cool drinks and snacks. This is an especially nice place to go very early in the morning or around sunset, as the masses descend to exercise and there are many interesting sights. How to get there: BTS Skytrain to Saladaeng Station or MRTA subway to Lumpini Station. This exquisite collection of traditional Thai houses stands as a museum to Jim Thompson, who recognized the tremendous opportunity to re-establish the Thai silk industry. Before his mysterious disappearance in Malaysia in 1967, his house was the talk of the town where he entertained his friends and visitors including the like of Somerset Maugham. The restaurant there provides a nice respite and they have some of the best pad thai in town. This is paradise for bargain hunters. Every Saturday and Sunday, 9,000 individual booths are open selling an infinite variety of goods. It is just about impossible to go to Chatuchak Weekend Market and not buy anything. There is just about everything that bargain-hunters, homemakers, pet lovers or just browsers can imagine. A note of caution: the crowds and heat can be overwhelming. Pace yourself, take plenty of breaks and drink plenty of water, and always keep your purses, wallets, and backpacks in front of you. Directions: BTS Skytrain to Mochit Station and walk the short distance or, better, take MRTA to Kamphaeng Phet Station, where one of the exits actually pop up in the midst of the market. Regardless of what else you do, I think you should ascend to one of the city’s many fine rooftop bars. When I moved here in 2005, there were only two. There are now dozens. Here are three I think are particularly worth it. Red Sky at the Centara Grand Hotel is located right in the midst of the Siam-Ratchaprasong district, full of tall buildings and lots of bustle. The views are great, the dress code not too restrictive (but don’t come in shorts and flip-flops) and the drinks are not too expensive. Directions: BTS Skytrain to Chidlom Station and then follow the signs on the elevated walkway. This newish Marriott hotel and serviced apartment in the trendy Thong Lor neighborhood isn’t very fancy, but the Octave rooftop bar is a perfectly flat, level place that looks like a fancy helipad. This gives you outstanding 360-degree views. Good happy hour specials. Directions: BTS Skytrain to Thong Lo station, take exit 3 and make a u-turn at the street level and cross Thong Lor at the intersection. This isn’t so elevated, but it is the rooftop bar atop a restaurant on the banks of the Chao Phraya River with a commanding view of the Temple of Dawn. Ironically, Wat Arun is best viewed at sunset, and so be sure you arrive a half-hour beforehand to grab a good seat. You can fit this in after visiting Wat Pho and What Arun. Directions: MRTA to Hua Lamphong Station and then taxi, or take the BTS Skytrain to Taksin station, descend to the pier, and take the Chao Phraya Express boat to Tha Tian (Tian Pier). Great list. I always bring guests to dinner at Yaowarat too. And when visiting Wat Po I get a foot massage at the back of the temple. I find the massages at the temple pricey. There is a place directly across the street that has Wat Po graduates and is cheaper.